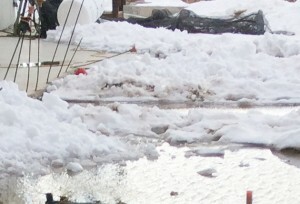 The recent snowstorm created a significant water issue in a billion-dollar construction project currently underway. 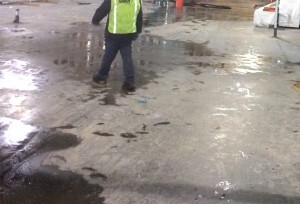 Over 50,000 square feet was impacted, and ServiceMaster NCR was the only company available to respond with the manpower and equipment necessary to begin removing standing water. Snowmelt and subsequent rainfall have necessitated that a crew be onsite daily to keep work areas clean and maintain a safe environment for the hundreds of subcontractors working in the facility. ServiceMaster NCR has now been designated the first responder for any emergencies that arise at the facility; this is a testament to our safety program, capability, efficiency and professionalism. Call ServiceMaster NCR at (703) 212-7000 – we are available 24/7/365!